NBC's Kerry Sanders reports from a helicopter high above Bloomfield, N.J., where drivers are lined up for miles waiting for a chance to fill up. The fight for fuel after Superstorm Sandy is getting increasingly desperate. A motorist was arrested Thursday after he tried to cut in line at a gas station in Queens and pointed a pistol at another motorist who complained, authorities said. Sean Bailey, 35, of Queens, was arrested on charges of menacing and criminal possession of a weapon, said Queens District Attorney Richard Brown. It wasn't clear whether he had a lawyer. If convicted, Bailey could face up to 15 years in prison. Damage from the storm has forced many gas stations to close and has disrupted fuel deliveries, causing long lines at the stations that remained open. Power outages kept many pumps out of service. Gas-seekers traded tips via social media and roamed the region for hours in search of functioning pumps. Police officers helped maintain order at the few stations in operation. At a Gulf station in Newark, N.J., a line of vehicles stretched for about two miles. Dozens of people with empty red gas canisters also stood in the line that snaked around the station. Betty Bethea, 59, had been waiting almost three hours as she approached the front of the line of cars, and she brought reinforcements: Her kids were there with gas cans, and her husband was behind her in his truck. "It is crazy out here — people scrambling everywhere, cutting in front of people. I have never seen New Jersey like this," Bethea said. 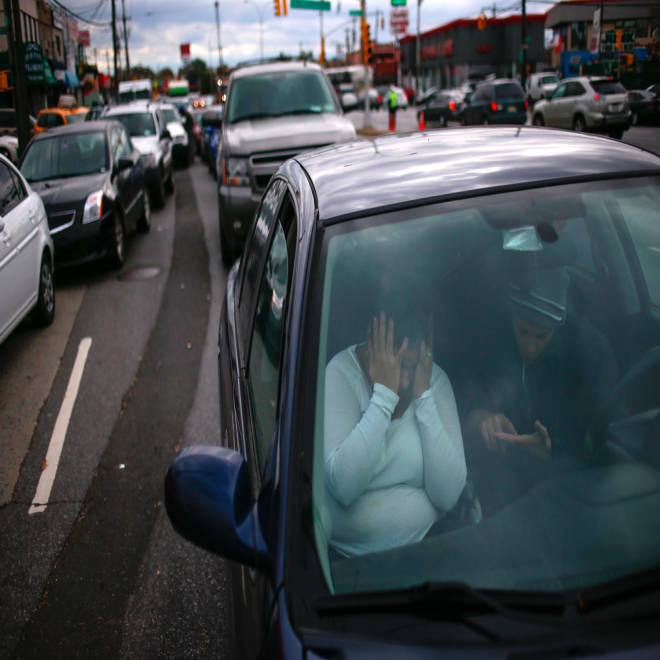 A woman covers her face in frustration while waiting for hours in line to get fuel outside at a gas station in the New York City borough of Queens on November 1, 2012. Numerous reports of confrontation at the stations that were still open surfaced on Twitter and YouTube. A fistfight broke out Wednesday between customers at the Getty station on Route 59 in Monsey, N.J., the only functioning station in the area, Chiam Tzik, the station's manager, told Newsday. On Thursday morning, traffic stretched for at least half a mile on both sides of the road. In New York state, Yonkers Mayor Michael Spano signed an executive order rationing gas to 10 gallons per customer effective immediately. At the heart of the fuel supply crunch is the fact that Sandy has devastated the energy industry's ability to move fuel into and around the New York City region, particularly the harbor, by any of the three means that normally supply the area: tanker imports from abroad; pipeline shipments from the U.S. Gulf Coast; or refinery production from the mid-New Jersey area. The good news is none of these issues appears to be especially long-lasting. Power is gradually being restored in New Jersey, where much of the key infrastructure is located and New York Harbor barge traffic is expected to resume later Thursday. A key pipeline should resume limited deliveries on Friday. Even flooded refineries should eventually resume production. But that's little comfort for those who need fuel now to get to work or to help heat their homes as a cold front moves in. With limited mass transit, more folks are forced to use cars, and that, combined with a gas shortage, is creating gas station lines extending for miles all over New York and New Jersey. NBC's Tom Costello reports.